Day 128 - Looking up at the Colorado College Center for the Performing Arts building. I took this shot as part of my project for the Monday Challenge of "Looking UP." I used my 10.5mm Nikkor fisheye lens, which distorted the shape of the building. I, however, like this effect. The building at this end is covered with copper tiles. Thanks so much for all the comments on my North Rim of the Grand Canyon shot. I am overwhelmed at the response to this image. For those of you who have inquired, the epidural cortisone shot this time does not seem to have made much difference, as yet. However, they say it can take up to a week to fully take effect, so I'm still hopeful. The first shot did give me a lot of relief, so this one may not make as much difference. Thanks for all your good wishes and have a great day! 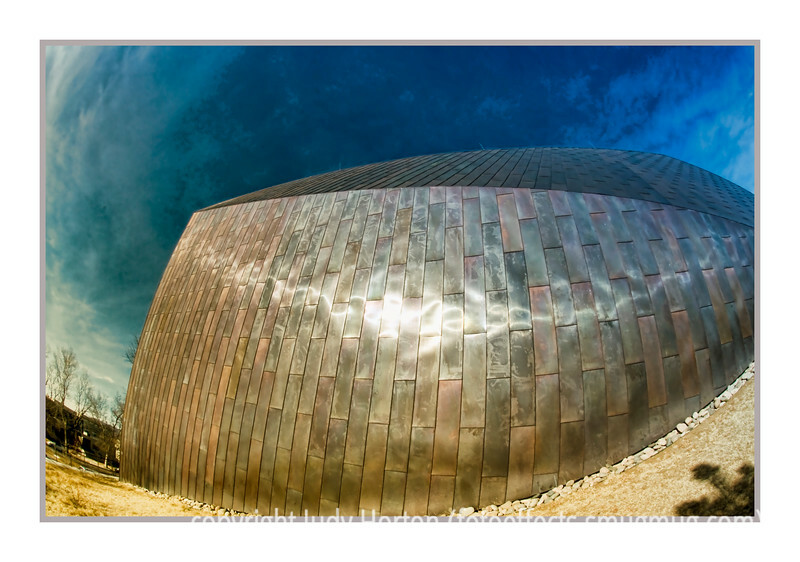 Terrific fisheye - love the architecture! What a great effect - hope you are feeling better Judy. The lines and details are really visible in the large sizes. I like this; it looks like a piece of art! it's a beauty! please get rid of that ugly frame! One of my favourites because I love the architecture and the way you've brought such emphasis to it! Wow, cool shot! It looks like a space pod.